Cute cat reading photo from here. 2. "This is your audience. This is your blog. Your audience probably likes you." - Jen Robinson, on how you can reach out to your blog audience to be supportive, during her and Sarah Stevenson's "Blogger Burnout: Suggestions For Getting Your Groove Back" session. 3. "Every kid is a different target audience." A brilliant comment by Charlotte Taylor that is still resonating with me. 5. 'You don't always know what the connections you make are doing. If I've met an author (and liked them) I'm more likely to put their book face out on the shelf.' - A librarian attendee. 6. If you want to see more diversity in children's literature, and the book you're reviewing isn't inclusive of diverse characters, you can point that out in your review. Sheila Ruth did just that in a recent review at Wands and Worlds, saying, "Unfortunately, I didn't really see much diversity in this future." And if a book you're covering does include diverse characters, share that! KidLitCon is the annual gathering of bloggers, librarians, authors and illustrators who share a passion for children's and teen literature. It was held in Austin, Texas Nov 8 and 9, 2013, and it was my honor to present and attend. My thanks to the organizing committee members: Pam Coughlan, Tanita Davis, Kimberly Francisco, Kelly Jensen, Jackie Parker, Jen Robinson, Leila Roy and Sarah Stevenson! You can find out more about the kidlitosphere and all our events at Kidlitosphere Central. I feel so famous, being quoted in your 7 lessons, Lee! I really like 5 - I missed that one during the conference. And, of course, there's always room to work on #6 and #7. Thanks for sharing these! So great seeing you. 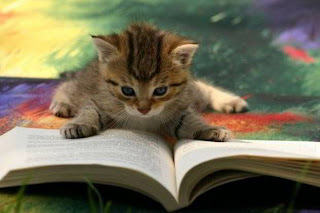 Great post, and the book-reading kitty is adorable. Charlotte's comment is still resonating with me, too, as is your comment that all of us are the other. I learned so much at Kidlitcon and I feel like it really altered my thinking. It was great to see you again. I miss everyone already! It was so lovely meeting you in person! And I am still thinking hard about your session on diversity--thanks for that! #3 and #4 are the ones that have stuck with me the most. But you're right: the fact that we read is a big thing. Great post, Lee. Now I have to figure out how to get my dog, Mango to learn how to read when I can barely get him to fetch. Dang. Thanks so much for this list. I was so disappointed that I wasn't able to attend KidLitCon13. Now I feel as if I've benefitted from it even though I wasn't there. Thanks again! This makes me wish ever more that I could have been there. Thanks, Lee.